The Mane Objective: YouTuber Turns Straight, Blonde Hair into "Afro textured hair" -- What's Your Take? YouTuber Turns Straight, Blonde Hair into "Afro textured hair" -- What's Your Take? As seen on Black Girl with Long Hair! A while back, BGLH posted about the trend of box braids gaining popularity among women with straight hair. Now it seems that another aspect of natural hair aesthetics is catching on. YouTuber Eskimohair, a fairly under the radar vlogger has come into the online spotlight recently for her "How to make straight hair into Afro hair tutorial" video. 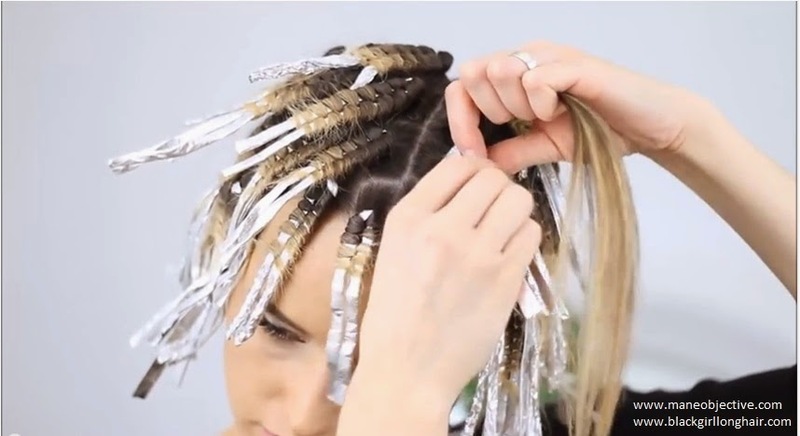 Although she has only 212 subscribers, the aforementioned video has garnered over 36K views -- exponentially more than any of her other hair tutorials. The video itself is fairly innocuous, with no inflammatory language or suggestions beyond "Afro textured hair. She doesn't even offer her viewers a voiceover of instructions. Yet, the comments section (which is 190+ comments deep, by the way) has some women (and men) up in arms. After pouring through the comments, I've concluded that there are two camps: camp one, which consists of those who don't think the video poses any considerable threat to women with natural hair, and believes that Eskimohair's video is more of a tribute or homage to our dynamically textured hair. Camp two feels quite the opposite -- that Eskimohair's video contributes to a dangerous trend of natively natural and Black hair aesthetics being deliberately appropriated by mainstream (white) culture. Who's right? It's a matter of opinion and perspective. Camp one's argument looks something like this: "She's not calling our hair nappy, ugly, or anything derogatory. She likes our versatility and texture, and chose to emulate it. There's no difference between what she did and Black women that wear weaves, get perms, and flat iron their hair. At the end of the day, it's just hair." With my rose colored glasses on, I can understand the kumbaya logic that drives camp one. Many of them feel flattered, honored even, to see their hair texture desired by a white woman (this in itself is problematic ideologically, but that's another article for another time). I don't believe that Eskimohair uploaded her video with ill intent, or the desire to mock and denigrate natural hair. I truly believe her motive came from a place of simple aesthetics -- attempting to emulate what comes to us naturally, for the sake of style or being on trend. It wouldn't be the first time that this has happened, either (sips tea). Camp two believes that while not ill-intentioned, Eskimohair's attempt at emulating our texture sends her down the slippery slope of cultural appropriation for personal gain. Camp two's concerns do not go unwarranted, though. Just ask the top hairstylists and brands what all the mainstream rage is right now. In case you didn't know, it's cornrows and baby hair. Like, Chili from TLC baby hair. There's no mention of the origins of these hair styles, although anyone with an inkling of an inner-city clue knows exactly where they came from. We've seen time and time again how the creativity and ingenuity of Black women has been virtually erased from mainstream culture. The contributions are essentially stolen, repackaged, and popularized without an inkling of consideration or acknowledgement of its originators. Even more troubling is the reoccurring theme of Black women enduring years of denigration and being told their natural features are ugly and unworthy, only to have white women adopt and surgically enhance what we've been told to be ashamed of for years. So again, we arrive at that point -- what's really at work here? What's the bigger picture? Personally, my feelings are hybridized. I don't believe Eskimohair is trying to stake a claim to #TeamNatural (like others have done). She's not pretending to be "down". On it's face, her tutorial is a glorified braid-out tutorial, akin to other straight-haired YouTubers who share how they get "mermaid waves" (with braids). Without knowing her personally, I can only give her the benefit of the doubt and assume that she did not upload the video with malicious intent. In other words, I don't think she's trolling us. However, ignorance or lack of ill-intent does not absolve her of complicit participation in an overall trend that erases Blackness for mainstream consumption. Again, I can't place the blame for what's been going on (since forever, but the trolling has been amped up in recent years) squarely on Eskimohair's shoulders, but as a YouTuber seeking to emulate a natural hair aesthetic, she does have some responsibility in the subsequent fallout. We've discussed time and time again how although biologically "it's just hair", for Black women, that simply is not the case. Many of us labored against our own mental barricades, our loved ones, and even our employers in a struggle to accept, embrace, and proudly show our natural hair. Wearing Afro-textured hair as a trend for a few days cheapens our journey to self-acceptance. At the end of the day, I believe there exists a teachable moment in this. Videos like the one Eskimohair created presents an opportunity to engage in a healthy dialogue around what it means to appropriately borrow from, share with, be inspired by, and educate others around other cultures. The internet and social media make the crossing of cultural barriers nearly inevitable. We can't stop anyone from doing a twist n' curl any more than we can keep Iggy Azalea from rapping. But what we can do is control the narrative surrounding our glorious crowns. What are your thoughts? How do you feel about the YouTube tutorial and subsequent reaction? I don't see anything wrong with her tutorial either. If that's the case then every race and ethnicity appropriates when really all it is, most of the time, a nod to whoever you found inspiration from. At one point I remember when Asian kids were trying to add texture to their hair because they appreciated black culture. I am a black woman who uses Indian Ayurvedic products/practices. Heck even shea butter, that's not black culture. I know other black women use them too so who are we to say who's stealing what. Indians can say the same about us especially with marketing of Indian ingredients these days. There's more to Ayurveda than pretty packaging. No one from Ghana is telling us to stop using their shea butter in scathing articles. That girl isn't stealing or taking anything because there is nothing to steal, it's knowledge, it's a technique. It's hard to barricade knowledge and dictate who can use it or get inspired by it. Is there a proper way to do it, yes. It should always be respectful and humble. I can't be a part of Camp Two because I use knowledge every day that isn't of my people/culture. Yet I do my research and be respectful so that's what I would ask of people who are inspired by cultures that are not their own. Shea butter and henna are also from Africa. They are just called different names based on the geographic location. I think it's an edgy club style. She probably thought long and hard about her choice of title. Ima leave it at that. Given this characteristic favorable position which blondes appreciate, wouldn't you get a kick out of the chance to transform yourself into one to experience direct the offer that this classification of ladies appears to ooze? It's less demanding than you might suspect. Also, you don't need to limit yourself to shading your own particular hair.